Generations of Australian fishers have been raised using alveys as their weapon of choice and the tradition continues strongly today particularly in the east coast states of Queensland and New South Wales. On the beach the alvey is renowned as a tough as nails surf fishing reel, a title it carries easily. How can you not love a reel that if some sand gets into it and it starts making a bit of noise you just shove down into the ocean, rinse out and go straight back to fishing. This ladies and gentlemen is the famous Alvey reel. Now to say I am a fan is an understatement, owning more than 30 of these aussie icons in a variety of sizes and styles I guess I should more likely be classed an addict. Like every reel they have their strengths and weaknesses, so lets get the bad news out of the way early. These reels are big and heavy and by nature introduce twist into the line, half a twist per turn when cast in fact. Add to that they work best when coupled with a purpose built low mount rod and some people give up without even trying them. Their loss because for the most part these problems are reasonably easily dealt with. The weight isn't too much of an issue when using baits due to the arms being in a relaxed position rather than out in front of you as with a conventional or spinning reel. Twist is simply removed through the use of two swivels and who doesn't buy a specific rod for a specific reel? Oh one other thing, alveys are not braid friendly and I would not suggest using it at all on them. Is this a negative? On a big spool that doesn't promote tight line memory like smaller spinning and overhead reels do. The need to use line that is less than half? a third or a quarter of the price of braid and can be grabbed to help land a big fish cant really be classed as negative. Need to muscle a fish? a 1:1 ratio is as good as it gets if stopping power is on your must have list. That and monster line capacities suited to ballooning that can bring almost any species into range of these reels. If you really want to go hard try the non drag models where palming the spool is the method for slowing fast running fish. If you are not so adventurous there is a wide range of dragged models as well as a few that offer geared retrieves. Above all things the feel these reels give is what I love most about them. The feedback you receive as you wind the line back on while maintaining constant contact gives instant notice of a subtle bite that might go unnoticed on other styles of reels. Slowly feeding line back into a current or working a retrieve in and back out while maintaining direct feel are something even dedicated bait runners can only partially do. My favorites are without doubt the the 500 and 650 sizes. The 500's are sweet for bait fishing for bream as well as light bay reef fish, bay tailor, close in surf species and tossing small metals. The 650's are my go to surf bait fishing reels however I have also put them through their paces inshore and offshore on many a big snapper, solid sharks and some quality mulloway. They are capable of spinning big metals along the surface in very short sessions but any longer than 30 minutes and you would be silly not use something better suited. 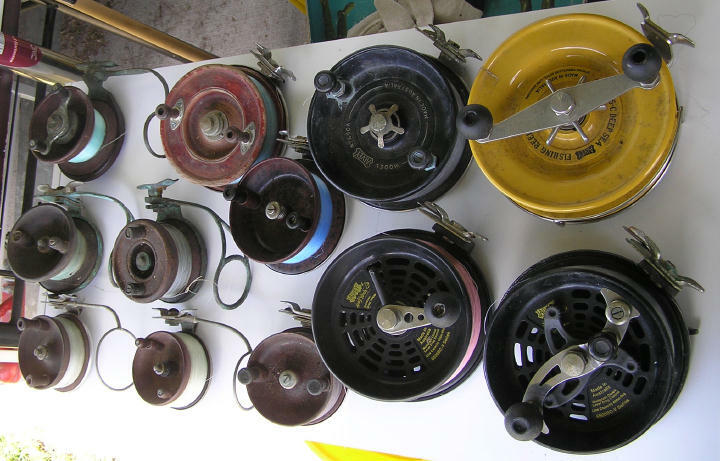 These are reels that will truly last most people a lifetime although I can say I have worn a couple out now that I have fished very hard in the last 40 plus years. All they really need is a new spool bush but I have so many reels I figure the old warriors can have a rest for a bit till I get back to them. So if you are like me and get sick to death of unnecessary technology and the over hyped BS surrounding it and just want something simple that works and does its job very well, grab an alvey and go catch some fish.